You might have made a significant investment of time and effort into the creation of the perfect ad campaign. You may even notice that the efforts are bearing fruit as the paid ad traffic increases. However, if the traffic is not undergoing conversions in a similarly high rate then all your efforts will have been in naught. 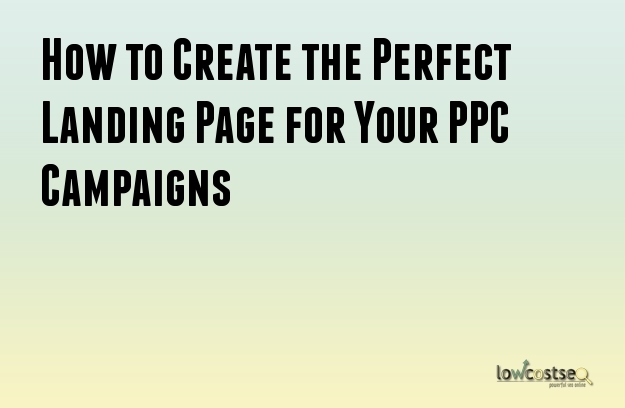 The best way to ensure a high conversion rate is by creating the perfect landing page for your ad campaign. Many companies prefer using the homepage as the landing page for the campaigns. However, that is a mistake. A separate landing page can be far for efficient and useful in increasing your conversions. Ultimately, the success of your ad campaign will be determined by the number of customers you have converted. Therefore, you need to make sure that the page in which the traffic lands up is suitable for the conversion process. This is something that the homepage is incapable of performing. Homepages will contain a variety of links and options. Therefore, the potential customers will be distracted which, in turn, makes them less likely to be converted. On the other hand, the landing page will be exclusively created for the sole purpose of converting them. In other words, the attention of the customers will be completely devoted to the conversion process. Here are some tips you can use to make sure that the landing pages have been created correctly. When it comes to converting your customers, you will certainly want the landing page to be highly efficient and effective. The only way to ensure these qualities is through an A/B test. A/B testing allows you to try out different variations of a landing page so that you can find the one that gives you the best results. You may be looking to target certain keywords for your campaigns. With landing pages, it is quite easy to do so. All you need to do is customize the landing page for each of the keywords you wish to target. Unique landing pages can be a good way to increase the interest of the customer. As a result, you can get higher conversions. One of the reasons for the unsuitability of the homepage for your ad campaigns is that the homepage will contain a variety of distractions. This should not be the case with your landing page. You will want the customers to focus completely on the conversion process. Therefore, all elements that do not contribute to this process are unnecessary and, therefore, must be removed. Some elements which you need to get rid of are too many CTAs, blog sections and news section. You should always have separate landing pages for each keyword or ad campaign. The conversion rate can be increased if the landing page is customized for a single campaign. Otherwise, the lack of continuity between the ad and the landing page can affect the visitors and make them less likely to convert.